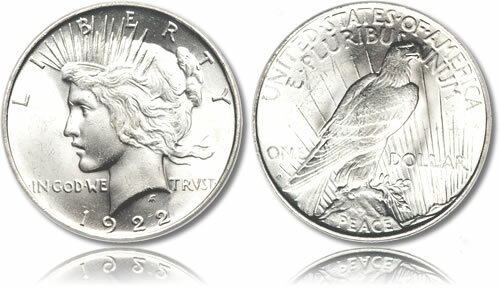 The Peace Silver Dollar was struck by the United States Mint from 1921-1935 from a composition of 90% silver. Each coin contains .77344 ounces of the precious metal. No silver dollars had been produced by the US Mint since 1904 owing to lackluster demand for the coins in everyday commerce transactions. However, the Pittman Act of 1918 would change that situation as it required existing silver dollar inventories to be melted and sold as bullion or produced into new coinage. To that end, millions of silver dollars were melted and the production of new dollar coins began in 1921. With no congressional mandate on a design, the United States Mint initially started reproducing Morgan Dollars which had been manufactured originally between 1878-1904. But, by December of 1921, the new Peace design was put into production. Original 1921 coins contained a high relief that was deemed impractical for use in commerce as they did not stack well. The US Mint in 1922 adjusted the design to be more shallow and continued with that design throughout the rest of the coin’s production. Under Presidential order, the Peace Silver Dollar was struck once again in 1965 (but with a 1964 date). These coins never made it into circulation, however, as Congress overrode the President’s decree and all of the 1965-dated dollars were melted. The coin takes its name from the fact that the word PEACE is inscribed prominently on the reverse. The obverse and reverse of the Peace Silver Dollar was designed by Italian immigrant Anthony de Francisci. He was the winner of an open design competition ordered by President Warren G. Harding. On the obverse, Francisci included a left-facing portrait of Lady Liberty with her mouth slightly open. Surrounding the portrait are the inscriptions of LIBERTY, IN GOD WE TRUST and the year. On the reverse, a Bald Eagle is depicted with an olive branch in its talons. Also included are the inscriptions of PEACE, UNITED STATES OF AMERICA, E PLURIBUS UNUM, ONE DOLLAR and the mintmark, if any.